The best wedding proposals involve things that you both care about. Memes, drones, and so forth. This proposal is especially cute because photographer Jerrit Pruyn combined his love for cameras with his love for his girlfriend. He etched 'Marry Me' inside his camera so when his girlfriend looked inside, she'd be asked the question. It's a wonderful story. Pruyn and his girlfriend visited a vineyard and put his camera on a tripod. While he asked his girlfriend to focus the shot he dropped to one knee as she looked through. She saw the 'Marry Me' and her boyfriend asking her hand in marriage. Perfect. She said yes. 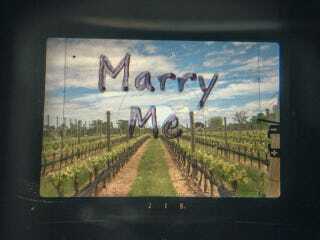 Pruyn had strategically wrote 'Marry Me' on an iPhone screen protector and placed it into his vintage Nikkormat SLR.